I moved into my second apartment somewhat slowly, having learned some – if not all – of the lessons of my first apartment, an unfortunate dump in a tenement building, with a living room so tiny that if you sat on the futon and lifted your legs parallel to the floor, your feet would rest comfortably against the facing wall. Its sole redeeming quality? A convenient location. What my second apartment lacked in convenience – it was a twenty-minute walk from the nearest subway station, an exercise regimen I wish I still had – it made up for in space: Two large bedrooms, a huge L-shaped living room, enough space for a second dining table in the kitchen. My roommate and I didn’t have much in the way of furniture – certainly nothing resembling two tables – but we did have lots of ideas, and our landlord gamely went along with them, letting us remove the hideous 1970s shag carpeting, loaning us a small sander that was meant for edging but which we used to refinish the floors of the entire apartment. Friends chipped in with hand-me-down furniture, and soon our apartment was fully equipped with an eye-popping blend of vividly patterned sofas and battered chrome thrift store tables, resting atop the gleaming wood floors. Each time a truck hit a pothole on the Expressway behind the building, the building shook slightly – we didn’t notice the sound after the first few days, but we did notice that each night, when we came home, the pictures that had earlier hung neatly on the walls now hung at odd angles. We didn’t consider it a problem, though – whoever came home first simply walked around straightening the pictures. On Saturday mornings, the noise of the trucks through the back windows woke us up early, but on Sundays, we were too tired to care, or maybe the trucks weren’t there – either way, we slept in. Sometime around noon, we would rouse ourselves and head over for the happily named Sunshine Diner, which served breakfast all day, if you knew how to order it: The default menu was written in Polish, while one written in English would arrive at the golden formica tables only on request. The eggs came with kielbasa. Pierogies were an option, while grits – to the eternal dismay of my southern roommate – were not. Though most of my neighborhood was Polish, my landlord was not. He was a Hispanic cop named Ozzie, and though his wife was named Yolanda, we called her Harriet – accidentally at first, then as a kind of running joke that she liked once we explained it to her. The landlord was taking college classes at night, so that he would be eligible for a promotion, and on learning that I worked for a magazine, asked if I could help him with his term papers. They rented out the best apartments in the building, and occupied a windowless finished basement, where we sat together in the evenings. As Yolanda made dinner, I would review each page as Ozzie typed it, sometimes asking questions, but usually just correcting his punctuation and spelling and moving a few words here or there so that it all sounded better. When the paper and the meal were done, the typewriter was removed from the kitchen table, and we all ate together. I loved Yolanda’s chicken and rice, but even more, I loved her baked ziti. I only lived there a year – my roommate moved back to the south, leaving me unable to pay the rent myself. When I had my own kitchen again, I tried to make something like Yolanda’s baked ziti, but it was never the same – I was never watching when she made it, so I didn’t know what the she added to the pot, and whatever it was, it most decidedly was not sauce from a jar or overcooked noodles. 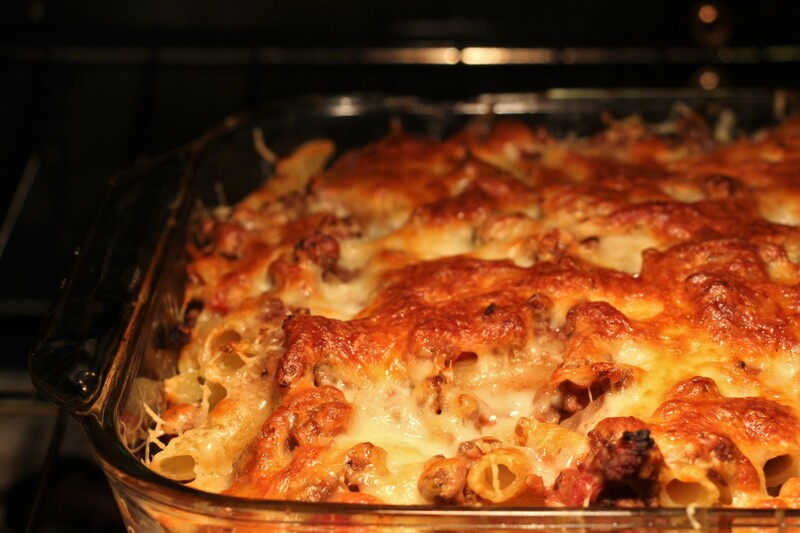 So, for many years, there was no baked ziti to be had, until I happened to spy a recipe on my feedly from the generally reliable smitten kitchen – so I gave it a shot. I didn’t have any ziti, which seems like a key failing, but of course you can use a pound of any sort of tubular pasta (I went with penne). The instructions are simple enough and there are a couple of crucial details – first, you really do want to undercook the pasta. She suggests about two minutes less than the package directions call for; this worked well in not producing a dish full of mushy noodles at the end. The other recommendation is to be generous with the seasonings if using ground beef, which gave me license to go a little nuts with the red pepper flakes, which I recommend doing. The other option is to use Italian sausage (removed from the casings, of course), and adjust the spices accordingly. The dish turned out perfectly – not at all like Yolanda’s, but satisfying and warming on a rainy Seattle night. The Child thought it was very good, and suggested I add it to the list of things I make that she’ll actually eat. As an added bonus, it makes a nice lunch the next day, or the next several days – or enough to feed a crowd, if you’ve got a crowd to feed. Cook pasta until al dente,about 2 minutes less than the suggested cooking time. Drain the pasta, reserving a cup of the cooking liquid. Rinse under cold water, and set aside. Reserve ½ cup cooking water, then drain pasta. Rinse under cool water, and set aside. Heat a large skillet over medium heat, then coat with olive oil. Add the onions and simmer about five minutes, then add the garlic and cook a minute or two more. Add the oregano, red pepper flakes, and salt, then the ground beef, cooking 6-8 minutes, or until it has lost all its redness. Add tomatoes, stirring to combine, and cook for five to ten minutes, pressing with the back of a spoon to help crush the tomatoes and break up any overly large chunks of meat. Adjust seasonings as needed, and simmer until it has a saucy consistency. Add some of the reserved pasta liquid if it gets too dry, too fast. and stir to combine. Stir in drained pasta, mixing well. Pour half of pasta mixture into a 9×13-inch baking dish. Sprinkle with half of each cheese, then pour in the remaining pasta, and top with the remaining cheese. Bake in heated oven for 30 minutes. On Mother’s Day, The Child and I brunched at a waterfront cafe; we sat outdoors and enjoyed the sunshine and the view, if not the speedy service. We were in no hurry, and slow service has benefits for conversation, leaving you with more space to fill, bringing up topics that might not have occurred to you if the waiter had remembered to bring milk and sugar for your coffee the second time you asked for it, rather than the third. It was around the time we had to ask for salt – isn’t that standard on restaurant tables anymore? – that the conversation turned to The Departed, and how unpleasant a dinner table could be with him at it, no matter how good the food. The Child and I don’t eat at the table anymore; even though we’ve replaced the table and the paint and the wall decorations we still cannot seem to relax and converse over dinner in our home, although it never seems to be a problem when we go out to a restaurant. We discuss that fact, and then talk about The Departed’s children, and their table manners, and his eating habits, and then we are back to admiring the beautiful weather and joking that he can now enjoy it more, since he doesn’t have to spend his days in a cubicle anymore. The Child mentions his girlfriend, the one she had contacted on Facebook, the one she tried to warn. After that incident, I visited his Facebook page a few times, and noticed the girlfriend was still liking and commenting on all his posts, although she had indicated to The Child that she had doubts about him, planned to break up with him. She’d had a change of heart, apparently, and messaged The Child to let her know: She ended things with The Departed. As it happens, she ended them right around the time he lost his job. We both smirk a bit, and the fact that the coffee I am sipping is now cold from its long wait for cream and sugar suddenly doesn’t bother me at all. What things appear to be versus what they are: It isn’t always easy to sort out, but a little patience and being open to all the possibilities seems to go quite a long way. A few months ago, I ran across a recipe in the New York Times for Braised Chicken Legs, from a new cookbook by Cal Peternell called Twelve Recipes . I made the chicken that night, because it had the one key ingredient I required at that moment: everything I needed to make it was somewhere in my house. The Child devoured the chicken, then a second helping, and then complained bitterly that I’d made something so delicious in such a small quantity. I made the chicken again a few days later, and again a week later, and for a while, once a week until I’d exhausted the supply of frozen chicken thighs in my freezer. Then I thought, if this Peternell guy’s chicken is that good, I wonder what the other eleven recipes in that book are like? So I actually ordered a copy of the cookbook, something I usually avoid doing, since if I bought every cookbook that piques my interest I’d be featured on a special episode of Hoarders. The book arrived, and I loved it, and marked off a dozen recipes, which sounds like I marked off every recipe in the book, except that the book – by my math – has far more than 12 recipes in it. No, I don’t know why this is. California math, maybe? It doesn’t matter: the cookbook is wonderful, offering up base recipes in a relaxed conversational style, and encouraging the home cook to use what’s at hand or what takes their fancy. If you’ve got a little of this or that, throw that in. If you’re in a mood for French style, omit this and add that. He doesn’t offer quantities when he does this; taste the food and when you like it, you’ve got it right. The book is also chock full of handy cooking tips, like heat the pan first, then add the oil – it reduces scorching. Basically, Peternell is offering not so much recipes as cooking lessons: here are some guidelines, but where you go with them is up to you. After marking off the recipes, I proceeded to make the chicken several more times, and then, finally, we were chickened out, so I moved on to the section on pasta. I started with the recipe for Cauliflower, Sicilian Style, because, as with so many things I do, I had everything on hand, and in this case, I was looking for new ways to serve cauliflower, which is healthy and hearty and doesn’t deserve to be steamed all the time just because I can’t come up with a better idea. In this recipe, cauliflower gets the Brussels sprout treatment, in which it is pan-roasted to sweet perfection. 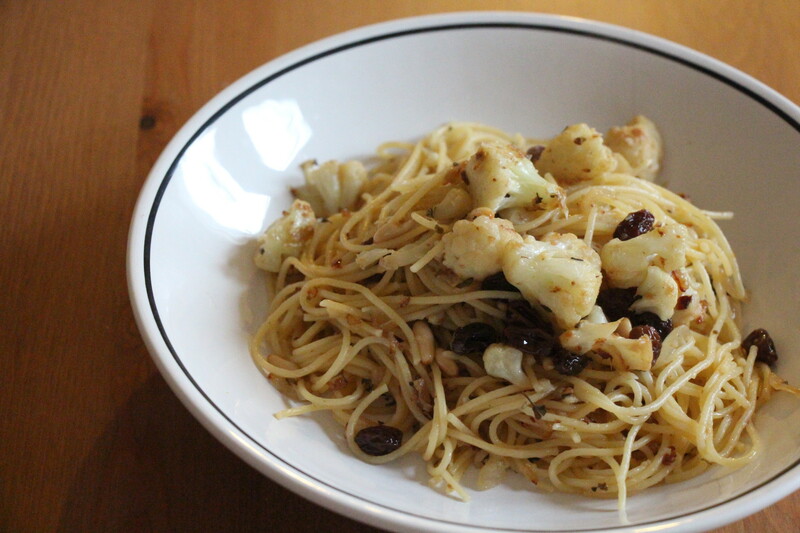 I loved the “Sicilian” treatment, with the addition of pine nuts for crunch and bits of sweetness from the raisins. The Child didn’t care for it, mostly because of the raisins. The recipe can be made luxurious with the addition of some saffron, which I planned to do, but then missed the step where I was supposed to add it, so I simply left it out. If you go this route, add the saffron to the onions. Since The Child didn’t care for this dish as much as I did, I didn’t end up making it over and over. But I did discover there’s a much better way to cook cauliflower than the way I have been cooking it, and since it’s so simple and requires no real recipe, pan-roasted cauliflower has been making regular appearances at dinner. Put a pot of salted water on to boil. Heat a skillet over high heat, and when hot, add 3 tbsp olive oil, then the onion and a pinch of salt. Once the onion gets going, lower the heat to medium and cook until soft, stirring occasionally to prevent browning, up to 15 minutes. Set the onions aside. Wipe out the pan, then place back over high heat, and when the pan is hot, add some oil, the cauliflower, and a heaping pinch of salt. Stir to coat the cauliflower with oil, but then let it sit, untouched, until it browns on one side, then turn and let it brown on the other. Hopefully by now your water is boiling, so add the pasta and follow the package directions to cook. When the cauliflower is well-browned and tender, push it to the sides of the pan, and add the garlic and red pepper flakes to the center, with more oil if needed. When the garlic releases its fragrance, add the onion, and once it's heated through, stir in the cauliflower. If it seems dry, add some of the pasta cooking water. Add the raisins and pine nuts. When the pasta is ready, drain it and stir it in. Add salt and pepper to taste; serve with parmesan cheese if you like. For a luxurious touch, add a pinch of saffron when cooking the onion. You can also toss in fresh parsley and oregano, at the end of the cooking. I got a review copy of Thomas McNaughton’s Flour and Water: Pasta – one of the most-talked-about cookbooks of the fall – and did a terrible thing: I laughed as I perused it. It’s not that I object to recipes whose names involve words I have to look up: Wild Boar Strozaprettii; Cocoa Tajarin with Brown Butter-Braised Giblets, Butternut Squash, and Sage; and Pappardelle with Braised Goat Shoulder, Anchovy, and Collard Greens. I have a dictionary. I know how to google. Nor do I object to including things like duck giblets, fuyu persimmons, or spigarello, on my Safeway list – why not turn a routine chore like grocery shopping into a scavenger hunt? It keeps things lively – count me in. No, my objection is this: Who has time to toast faro and make pasta out of it using a custom bastoncino dowel and hemp comb on a Tuesday night after work? Still, it was hard to see the cookbook popping up on Amazon and the Tasting Table newsletter and Bon Appetit’s Facebook feed and not think that maybe there was more to it, so one evening I sat down and read a bit of the introductory section, which had some very useful tips for cooking pasta, notably this one: cook your pasta about 80% through in salted water, but then finish the last 20% of cooking in the sauce. It infuses much more of the sauce flavor onto the pasta. Genius, I thought, and read on. It turns out, the authors really view the recipes as starting points: If you want to try your hand at making pasta, there are recipes and instructions and helpful tips for doing so. But if you don’t, they make suggestions for store-bought alternatives. There are alternatives for the more challenging ingredients, as well – apples for fuyu persimmons. I can do this. Armed with that information, I discovered plenty of recipes I could make at home, in a regular suburban kitchen, on a chilly autumn Sunday afternoon, when I have time to cook something in a long, slow, braise. I chose a recipe that would require the fewest substitutions – Toasted Farro Garganelli with Short Ribs, Hazelnuts, and Radicchio – and then took their advice for simplifying it, by simply serving the braised meat on a bed of polenta. 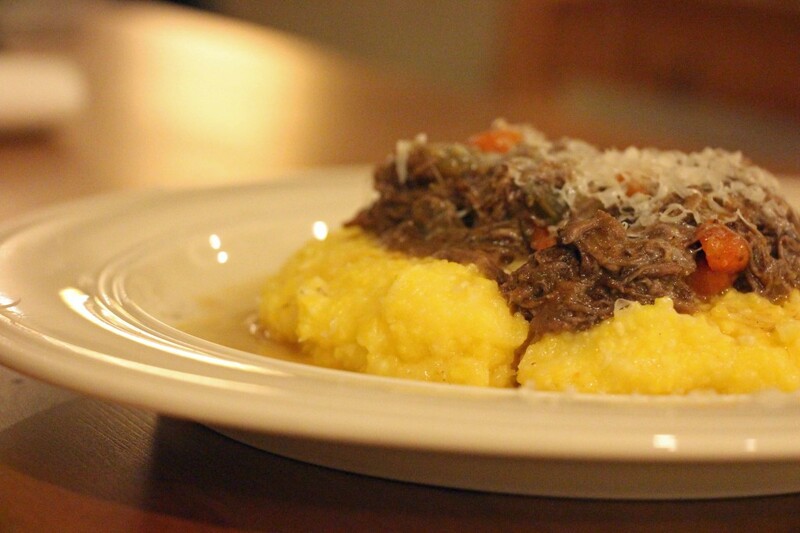 It’s possible I am the world’s worst polenta maker, and also possible that their advice was a bit off the mark here, but whatever the reason, it didn’t work: the resulting plate was watery and bland, unless you just ate the braised meat off the top, as The Child did, and fed the polenta to the Red Dog without even a pretense of hiding it from me. The meat was pretty good, she said, but dinner was weird. The next day, though, I found myself picking on the leftover meat in the refrigerator, and the following evening, we got home, I boiled pasta in one pan and reheated the braised meat in another, and then finished the pasta just as they suggested, cooking it in the sauce for the last couple of minutes. It may have been the best pasta I ever ate. The Child agreed, declaring it The Best Pasta You Ever Made, eating two servings, and taking the small bit of leftovers to school for lunch the next day. I omitted the hazelnuts and radicchio from the original recipe, though I think the radicchio in particular would be a welcome addition to the dish. I chopped the carrots and celery into the three-inch chunks as directed, but it would make more sense to me to cut the pieces smaller to begin with, rather than slice them twice. Some of the quantities listed in the recipe were off (I had two cups of meat after braising, rather than four as stated, but it was more than enough), and it called for mysterious quantities – how much is 1/4 bunch of thyme, anyway? I grow my own, so I took a guess and used four three-inch pieces, and that worked out fine. My cooking time was much shorter than indicated, possibly because I cooked it on the stovetop rather than in the oven. And yet, it all worked, and rather deliciously at that. Finally, this dish can easily be made ahead of time – do the braise when you have time, then refrigerate until you’re ready to make pasta and serve. And the leftovers are a fantastic lunch. Don’t do this. Serve it with pasta. Season the short ribs with salt and pepper. In a large pot, heat olive oil until almost smoking. Add short ribs and sear on all sides until deeply browned, about 15 minutes. Remove short ribs and set aside. Add the carrots, onion, and celery to the pan and cook until the onion is translucent, about 8 minutes, then add garlic and cook another minute. Add tomato paste and cook a minute more, then pour in the red wine, and cook it down until it is almost gone. Return the short ribs to the pan and add chicken stock, bay leaves, thyme, and rosemary. Bring to a boil, then decrease the heat to a simmer, cover, and cook several hours, until the meat is falling off the bone. To finish: Bring a large pot of salted water to a boil; bring the pot with the short ribs to a simmer. Cook the pasta about 80 percent through, then drain and add it to the simmering short ribs along with the butter. Cook until the sauce coats the back of a spoon. Add the sherry vinegar, and salt and pepper to taste. The original recipe called for one half onion; I used a whole onion and liked it. I didn't really know what they meant by ¼ bunch thyme, so I used four three-inch pieces of fresh thyme. For ½ spring of rosemary, I used a two-inch piece of fresh rosemary. The original recipe also calls for oven braising, which can be done in a dutch oven, in a 325 degree oven, for about 5 hours (cook until the meat is falling off the bone). Finally, McNaughton uses his own, fresh-made "garganelli" pasta in this dish, but suggests penne as an alternative; I used casarecce, which is similar.